GLENDA'S FAMILY PICTURES ARE BELOW. BUT 1ST HERE ARE SOME tHAT SHE BOUGHT AT A LOCAL GARAGE SALE YEARS AGO. do you know who they are? SHE WOULD LIKE TO give THEM TO A FAMILY MEMBER. This first one is a wedding picture, as can be ascertained by the young man in the center back holding a buggy whip; as Historical Society member Bob Blecha has explained in showing one of his family photos from this era, the driver of the wedding buggy/carriage was a place of honor in the wedding party. Brides were not necessarily wearing white in those days, but the couple fo the right are probably the bride and groom, leaving the couple on the left as the maid/matron of honor and best man. This is all guessing but maybe it will get someone to thinking. Labeled Emil Welkey and friend. It may be in Colorado. It's not in Table Rock. Photo 3601. Labeled Blanche Hubka. In July 2017, genealogist Linda James said that a Blanche Hubka is in her line, and married Ivan Skalak. She will go through her materials and see whether this photograph might be her Blanche Hubka. 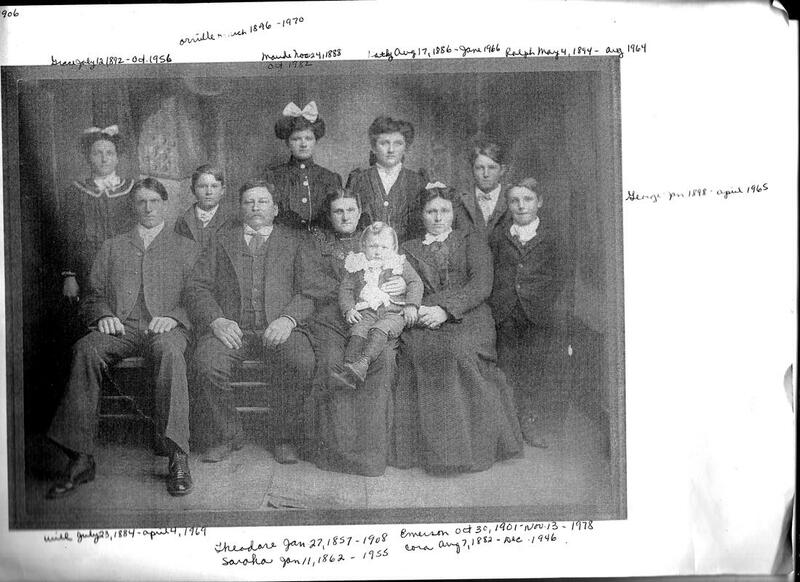 This is the Theodore & Sarah Alderman Family circa 1905 or 1906. Front row: William Arnold, Grandpa Theodore, Grandma Sarah holding Emerson, Cora, and George. Back row: Grace, Orville, Maude, Katy, and Ralph. This is a photocopy of a photo. An image of the photocopy with dates of birth and death annotated on it is below. The Alderman family again. Names are annotated on the album page that Glenda has and that page is after this picture. Glenda identifies her Grandma Alderman as the older woman in the front row, far right. Front row: Grace (husbands Harry Carter then Henry Boltjes), Maud (husband Pearl Morton), Katy (husband Floyd Hayes), Cora (husband Henry Epley), and Grandma. Will Alderman in front of his home in Table Rock. Photo 3605. Myrtle Alderman, Will Alderman's wife. Photo 3606. Myrtle and Will Alderman. Photo 3607. Photo 3622 -- "Grandpa & Grandma, Uncle Walter & Aunt Mary"
Photo 3618: "Mom, me, June"
Photo 3620 - "Uncle Walter with Aunt Mary and Grandma"
Glenda has a variety of school pictures that were passed on to her. They are obviously from Table Rock except for two. They gave no names or clues, other than one in which the students are holding a sign saying "Seniors 1938," which turns out to be the Class of 1939! Glenda and her dad, Art Alderman, Class of 1945, looked over the photos and recognized a few people, as did Willard Binder, also in the Class of 1945. Some of the students like Arvid Blecha, Norma Wopata, and Lois Mae Binder, are recognizable and the alumni records list those three as in the Class of 1939. We know this one is the graduating class of 1938! Wouldn't you think? But no! That is definitely Arvid Blecha in the back, fourth from the left, and Norma Wopata Binder in the middle row, far right. They both graduated in 1939. They would have been seniors in 1938, at the beginning of the school year. So this would be the seniors who would graduate in 1939, but in the first half of their senior, in1938. Below this photo are the names of the students in the classes of 1938 and 1939 so you can compare for yourself. Here are the names of the graduating class of 1939, who were seniors for the school year 1938-1939. 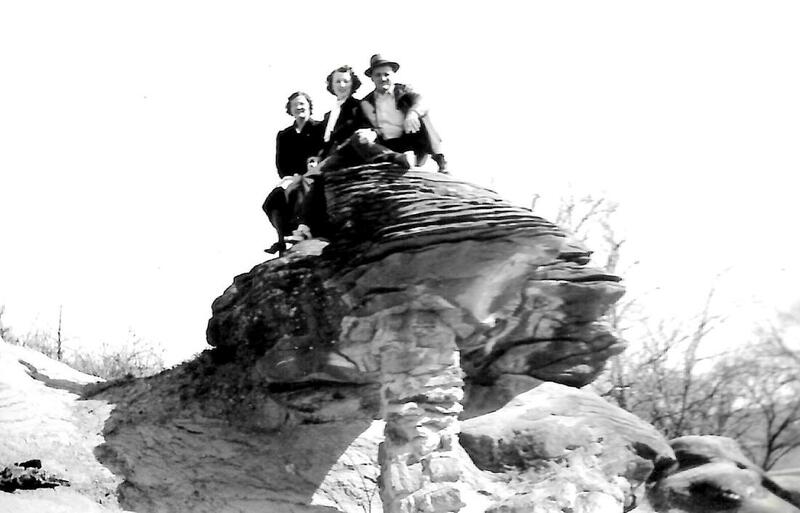 As of April 2017, the records of the Table Rock - Steinauer Alumni Association reflect that Frances Gillespie Talbot and Roy Hruska are still alive. Here are the members of the class that graduated in the Spring of 1939, according to the Table Rock-Steinauer Alumni Association. Three are still alive according to their April 2017 records -- Erma Gold Lewellen, DonaldHorton, and Arlene Vondrasek Holecek. Norma Wopata and Arvid Blecha are readily recognizable, back row, 3rd and 4th from the left. 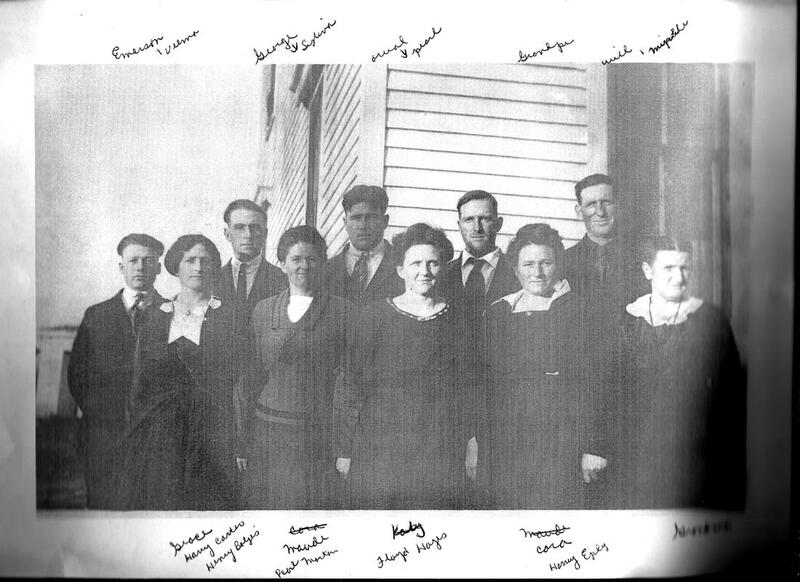 That looks like Lois Mae Binder in the bottom row, third from the right. Those three all graduated in 1939. 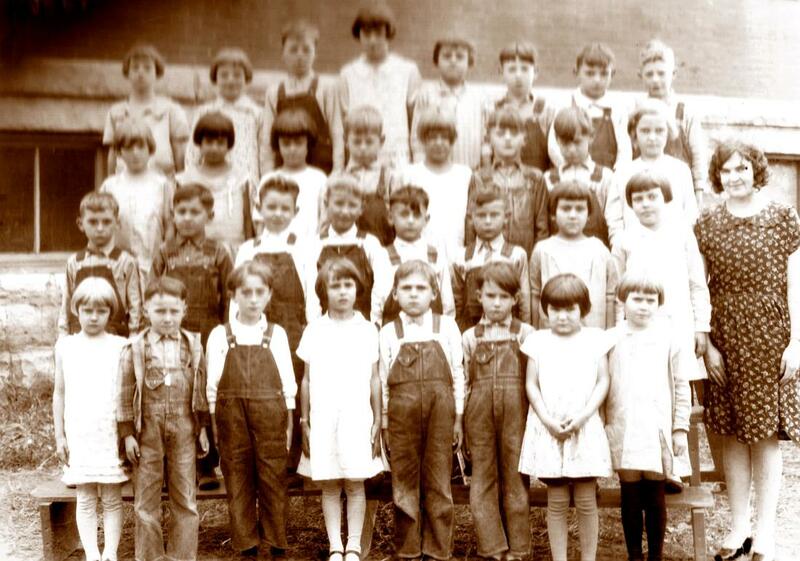 Thus, it seems that this photo includes students who would graduate in 1939, but prior to their last school year. Note: This picture has four more students than the number who graduated in 1939. Did four students leave before the senior year? Or is this some combination of students from that class and another? Some of the same kids again. Looks like Norma Wopata Arvid Blecha again standing next to each other, 3rd and 4th from the left, back row. Which school year was this? And which classes -- above or below the 39'ers? There seems to be a wide disparity in ages. Elementary school? This is definitely not the whole school. Art Alderman spotted Micky (Orville) McKnight (front row second from right); he was in the Class of 1938. Whoever these students are, the photo was taken the same day as the one below -- the same vase of flowers is on the window sill. Is this photo from Humboldt? One young man has an "H" on his jacket, and the structure of the building appears different than Table Rock. This photo was taken in the same place and time as the one above, Photo 3611. Observe the vase. Why are there only young ladies in the picture?